Spring… season of love, flowers, allergies and quickly forgotten midseason shows. It’s quite exhausting to keep up with all the year-round new shows, especially now that Netflix premieres a new awesome original series every other week, but… I try. 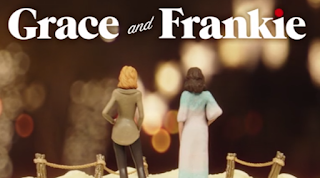 This show was developed by one of the exec producers of Friends, it has a fun setting and four old timey solid actors (Jane Fonda, Lily Tomlin, Sam Waterson, Martin Sheen). There was no way it could turn out to be awful. And it isn’t, but… it’s not awesome either. It is possible that 10 to 15 years ago, we would have seen this as an edgy premise and an exciting concept. But this is a post Will & Grace world, with shows like Transparent [which I have yet to see] already leaving a mark. So, unfortunately, the premise alone is not enough to hold the show. Should you watch it? Do watch it if you are a fan of the actors or if you are out of comedies to watch, but if you decide not to… it won’t be the end of the world. Really. Time for my first "untimely new show review of Spring", but seriously... who has time to watch it all live nowadays? Premise: The lady from Bunheads [AKA Lorelai 2.0] pretends to be 26 [she is actually 40] to get into the competitive publishing industry. It’s sort of like Never Been Kissed meets The Devil Wears Prada. So it can be a little hit and miss where Darren Starr is concerned, but on top of that Younger had Hilary Duff [which always makes me think twice before watching]; but I like Sutton Foster and I didn’t hate the premise so I decided to give it a go.Younger may not be the type of quirky, edgy comedy that gets me excited; however, I found it thoroughly enjoyable. Sutton Foster is great as a leading lady. She is likable and funny, the storylines feel fresh and they tackle some situations and topics that surprisingly haven’t been exhausted yet. Plus the premise offers something to different generations of the audience. More mature viewers can relate to all the jokes about the self-involved-social-media-obsessed new generation, while younger viewers can find common ground with the characters who are struggling to start a career. If I had to rank all the new comedies of the year, Younger would be right behind Unbreakable Kimmy Schmidt and quite a few steps in front of One Big Happy [which was cancelled]. Should you watch it? Yes, it’s cute. Plus already got picked up for a second season. Verdict: It’s like Twin Peaks meets The Sixth Sense meets Stepford Wives… which is obviously cool. Among all the “event series” of the year [which I just like to call MINISERIES], this is the one with the most interesting concept. What I loved the most about it is that, unlike most new continuous dramas, Wayward Pines is NOT trying to find itself. It came out of the box with a perfectly defined tone. If I had to make up a genre for it [like Netflix does], it would be “creepy-mystery-thriller”. 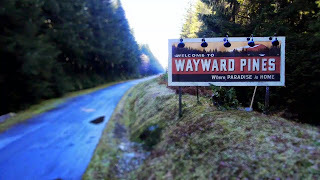 Before it premiered, everyone was comparing it to Twin Peaks, for obvious reasons, but I think Wayward Pines has its own style [and let’s face it, nothing really IS like Twin Peaks]. 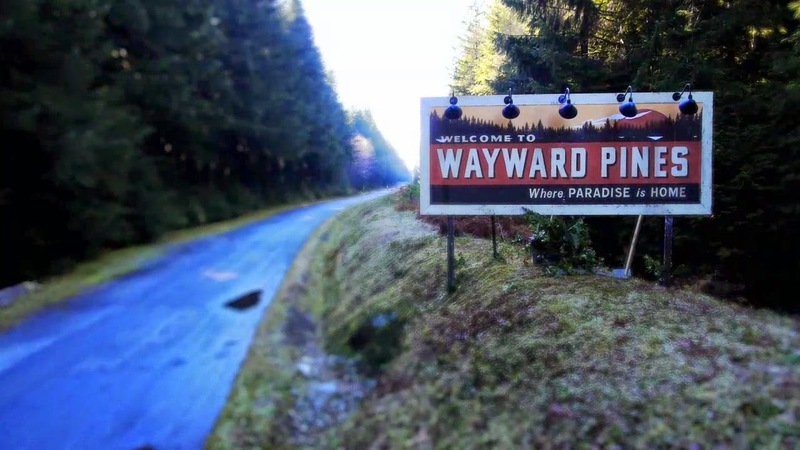 Wayward might be closer to Bates Motel or Shutter Island. And it has the combination of darkness and quirk that Gotham should have had. I think I am going to enjoy it a lot! I’ve only seen one episode and I am already intrigued. What exactly IS this place? What’s up with Juliette Lewis? How did they turn Carla Gugino into the perfect housewife? And where the hell are all the crickets!? Should you watch it? As far as minis go, I think this is definitely worth your time. I was a little saddened to see the ratings were not good, but maybe post-finale week will be better. Anyway, it is online! Check it out! 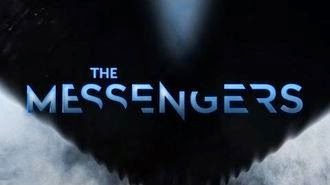 Premise: Something happens to some people and they become some sort of “messenger” angels that need to do some stuff. Oh… and Lucifer is there too. The CW clearly gave up on this show before it even premiered and I wasn’t particularly interested. However, for the sake of fairness, I decided to give it a go. You never know when an unexpected show may suddenly become your favourite, right? Well, this was not the case. After suffering through the pilot I had the awful feeling that I just lost an hour of my life… [and with so many other TV shows I need to watch!] I am sure some people may find this Angels-in-America premise intriguing [not me]; regardless, the show was not well executed. Some of the actors were really not good [others were so let’s not generalize], the script had a lot of flaws and there wasn’t one thing that grabbed me. I am not even sure if I didn’t get it or if it was just boring [it was definitely as confusing as Dig] The Messengers also made me realize that I DON’T like religious undertones on TV shows [same issue I had with Resurrection]. I refrain from writing negative reviews as much as possible, but this might just be the worst new show I’ve seen all year [with Weird Loners in the running]. Should you watch it? Well obviously I am not about to recommend it. Premise: A man who was blinded in childhood becomes a vigilante. I think I should start this review by confessing that I have never read a comic book/graphic novel in my life [which is frankly surprising because I am a total geek], so I won’t pretend to be an expert on the subject. However, I have watched most of the movies and virtually all the superhero TV shows [Agents of SHIELD, The Flash, Arrow, Gotham, Smallville, EVEN Birds of Preyand many more] so I am not completely ignorant either. But let’s forget about the fact that this is a comic book adaptation and judge Daredevil as a TV show [I may not know a lot about comics but I sure as hell know a lot about TV!]. In a nutshell, Daredevil works. It works on many levels. The backstory of the hero is original and compelling [which is a common thread with Marvel characters. Go Stan Lee! 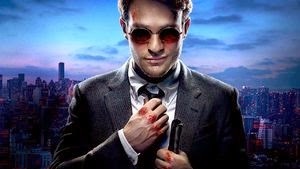 ], the casting was perfect and brought back two HBO favs: Charlie Cox [SPOILER ALERT famously killed on Boardwalk Empire] and Deborah Ann Woll [the redhead we actually liked on True blood]. In addition, it looks great! It looks gritty, underground, it looks the way a graphic novel on screen should look. Plus the writing was pretty solid and works well with a procedural element [much better than the slightly disappointing Gotham]. I still have the rest of the season to watch, but the word online is that it gets better and better… so yeah, as of today I am quite excited about this show, more than I usually am for this genre. Should you watch it? Normally I would say “watch it if you like superhero stories” like I recommended after I first watched Arrow and The Flash… but in this case I am simply going to say: YES. Even after one ep I can tell this is worth the streaming time. I was actually looking forward to this show [naïve on my part maybe]. As a single gal myself, I liked the idea of a show that was about unattached people. I was imagining a slightly satirical comedy about single guys and girls with relationship issues trying to cope with life on their own. The teasers looked fun, the cast was pretty good but… it just didn’t work. All the situations, scenes, dialogue and relationships felt completely staged. The pilot episode is about the characters meeting each other for the first time. That was probably the main issue. You have four characters living in a big city, each with their respective backstories and issues and somehow they end up together having dinner and crashing a party. All in 20 minutes or less… there was no way to make that “natural” [but they managed to make it feel as forced as possible. Should you watch it? I really like Becky Newton, so I am going to give it two or three more episodes… but I think this is a goner. Well, since I fell asleep twice during The Messengers first ep, I don't even have as much to go on as you, to form an opinion. And yet, somehow I arrived at the same one. It really was complete drivel.